Buckle up for a fast ride. 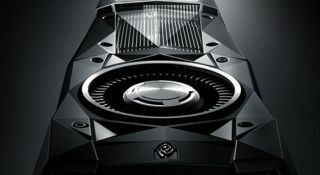 It's only a matter of time before Nvidia rolls out a GeForce GTX 1080 Ti graphics card—perhaps at CES in January 2017 where company boss Jen-Hsun Huang is scheduled to be the first keynote speaker. If so, that means it will be an agonizing three and a half months before we learn what the GeForce GTX 1080 Ti is rocking underneath the hood, at least officially. Unofficially, we might already know thanks to a set of leaked specs making the rounds. A forum member at OC3D provided the site with purported details of the 1080 Ti. If the leaked specs turn out to be legit, it will prove a strong contender to the Titan X, from which it borrows the same GP102 GPU. According to the leak, the 1080 Ti will sport 52 streaming multiprocessor units, down from the Titan X's 56, and 3,328 CUDA cores, not far off from the Titan X at 3,584 and considerably more than the plain GTX 1080 at 2,560. The GTX 1080 Ti is clocked faster than the Titan X with base and boost clockspeeds of 1,503MHz and 1,623MHz, respectively, compared to 1,417MHz and 1,531MHz. It all translates into 10.8 TFLOPs of compute power, just under the Titan X's 11 TFLOPs. Where the Titan X still has a significant advantage is in memory bandwidth. It has 12GB of GDDR5X memory on a 384-bit bus pushing 480GB/s, whereas the GTX 1080 Ti pushes 384GB/s with the same amount of memory on the same bus width, but using slower GDDR5 chips. Still, that's a notable improvement over the plain GTX 1080, which uses 8GB of GDDR5X memory on a 256-bit bus to achieve 320GB/s. It seems odd that Nvidia would swap GDDR5X for GDDR5 on the GTX 1080 Ti when both cards above and below it use the fast memory. That calls into question the validity of the leak, though with GDDR5X Nvidia risks usurping the Titan X with a card that should end up costing less. By jacking up clockspeeds (compared to the Titan X) and going with a fatter memory bus (compared to the plain GTX 1080), Nvidia can find a happy medium between the two without cannibalizing sales of either one. Update: This appears to be similar information to what was 'leaked' last month by another site. Until the card actually launches, we'll probably see more leaks. We've posted our thoughts on the GTX 1080 Ti leaks further discussing the situation.